Entertaining as it may be, the NFL is one of the most dangerous contacts sports in history. With powerful athletes pounding on each other, the sport has unfortunately been a witness to a number of dreadful injuries. While we all want our favorite athletes and teams to lay it all on the field, it is extremely tough to watch any player suffer a painful blow in the game. From career threatening ones to season-ending blows, injuries are without doubt a major downside to the game. While the medical teams have no doubt become better, the athletes have grown bigger, faster and stronger today! Horrible injuries are bound to occur when these gladiators bang into each other during the game. The impact is often felt by the spectators, either in the stands or via television. Many argue that the sport is too brutal to be enjoyed, with concussions, broken legs and head traumas occurring regularly. The violence and its impact cannot be disregarded, in spite of it being a raw, combat sport. Players have complained of a damaged brain in the recent past, with many professional athletes retiring early due to the same. Should the sport be scrutinized or have its rules looked into, is a different debate altogether - one we should definitely discuss later. Here is a list of the five most horrific injuries in NFL history, tough to read as it was to write. 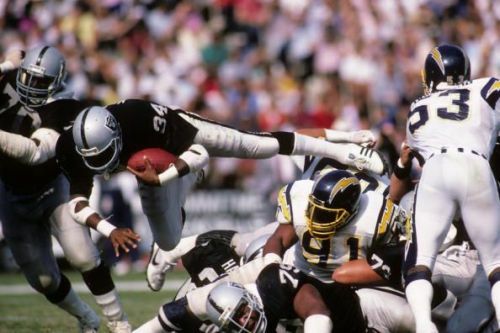 The Los Angeles Raiders running back suffered one of the worst season-opening injuries in NFL history when he had his kneecap dislocated against the San Francisco 49ers in 1994. Rushing up the middle, Napoleon was heavily tackled by a group of defenders. With his leg caught between two players, he horribly tore his kneecap and his dreams of playing in the league. A career-ending blow, he never set his foot on the field again. Players on both ends could not believe what they had just seen, with many moved to tears. The video is heartbreaking and a pain to watch even today.